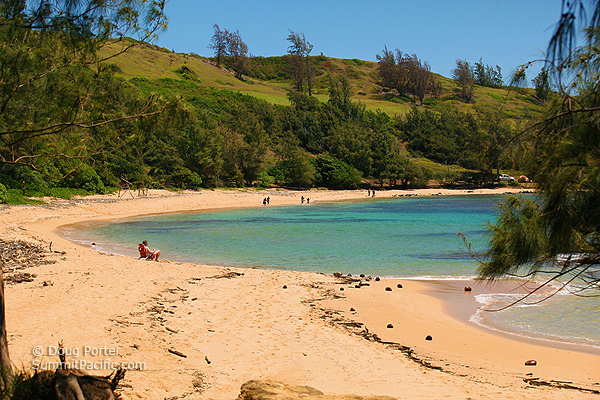 Moloa'a Beach and Moloa'a Bay (pronounced Molo-ah-ah and often spelled Moloaa) are on the northeast shore of Kauai, roughly 11 miles up the coast from the town of Kapa'a. The bay is a third of a mile wide with each end outcropping back slightly into the bay. A stream entering the bay divides the crescent shaped beach in two but is easily crossable if you don't mind a couple of footsteps in the ankle deep water. Several homes have been built near the center of the beach, but the ends of the bay offer nice large areas that don't feel like you're sitting in someone's front yard. Moloa'a is a good beach to spend a few hours reading, beach combing, fishing, or just taking a nap. The biggest drawback to the beach is that it has very limited parking. Moloa'a Trail: If you're feeling a bit more ambitious than a nap, you can traverse the coastal hillside along the Moloa'a Trail north to Larsen's Beach. The trail is part of an ancient network of footpaths that once encircle the island. Some controversy exists about the original location of Moloa'a trail and the landowner's efforts so move it from its historic location and further away from his property. A few good snorkeling spots exist in the bay and are quite fun if the ocean is calm. It's best not to enter the water during high surf because strong currents develop and it's easy to be pulled out to sea or pummeled into the shallow reefs in the bay. Take a few minutes to observe conditions and if in doubt ask locals for advice. The beach takes its name from the Hawaiian word molo a'a which translated means "matted roots." Paper Mulberry trees once grew so thickly here that the roots were interwoven. Uphill from the bay is the Moloa'a State Forest Reserve. Heavy rains can sometimes wash a fair amount of wood debris downstream from the reserve and can remain in the bay for a day or so after big storms. Driftwood and coconuts tend to accumulate on the beach but this makes it more interesting for beach combing. Moloa'a Beach Vacation rentals nearby include the Skipper's Beach Cabana, and of course, Gilligan's Beach Cottage. A 1946 earthquake in the Aleutian Islands triggered a tsunami that struck Hawaii. The biggest recorded waves to hit Kauai were at Moloa'a Bay and were 38 feet high! (11.5 meters). ... still want to take that nap? Directions to Moloa'a Bay Beach: 7 miles north of Kapa'a on Kuhio Highway (Hwy 56), turn right onto Koolau Road. In 1.2 miles turn right on Moloaa Road and follow as it descends into a residential area and ends near the beach path. Parking is very limited and if there's a parking lot, I've never seen it, but I have always managed to pull off the road just barely far enough to park. A beach path behind the houses takes you to the center of the beach. There are no facilities and no lifeguard here.